Hoste Hainse and Jagriti Child and Youth Concern Nepal(JCYCN) jointly organized the Education Material distribution and Interaction Program on Role of Stakeholders to promote the child friendly VDC in Pragatinagar, Nawalparasi on 15th of May 2014. 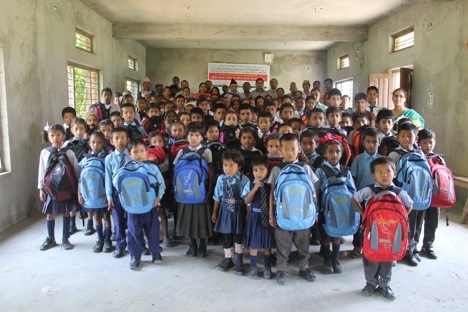 We succeeded in distributing the educational materials to 70 underprivileged kids from five different government schools (Pragati Primary School, Janajoyoti Higher Secondary School, Narayani Primary School, Balmiki Primary School, and Dibajoyoti Lower Secondary School) in the locality with the support of Hoste Hainse and Nepalhilfe Bietigheim Harsfeld e.V Germany. Most of the beneficiaries are from the very poor families and minority groups. Some were orphans. Altogether there were 150 participants including 70 kids and their parents, teachers, local activists, political leaders, youths and government officials. The program was conducted by the Chair of Mr. Tilottam Paudel, President of JCYCN and was facilitated by Mr. Dipak Sharma, General Secretary of JCYCN. Most of the speakers discussed the role of stakeholders to promote the child friendly VDC and the possible opportunities and challenges. On the program: Mr. Jiblal Shrestha, Secretary of Pragtinagar VDC, Mr. Badri Koirala, former Joint Secretary of National Planning Commission, Ms. Krishna Kumari Shrestha Literary Person ,Mr. Khimananda Bhusal Member of Teachers Union, Mr. Purusottam Neupane Teacher, Ms. Pratima Dhakal President of Network of Child Club and Jagriti Child Club, Mr. KB Rana National level Journalist, Mr. Garendra Wagle Director of Urban Development Training Center Pokahra, Ms. Radha Paudel President of Paraligal, Mr. Jay Narayan Sapkota Leader of Nepali Congress, Mr. Hukum Subedi leader of U-Maoist, Mr. Hementa Shrestha leader of CPN UML, Mr. Deepak Prasad Bashyal Program officer of Hoste Hainse and last but not least Mr. Tilottam Paudel President of JCYCN delivered their speeches with the focus on how we can make the place child friendly and its importance. Also, Speakers focused on the new challenges faced since the announcement of the new municipality named Devchuli including three VDCs, Pragatinagar, Devchuli and Daldale. Previously, Pragatainagar was the only VDC that ensures that the place is as child friendly as possible. However, there are now two more VDCs that have been added to look after the same place. We are requesting for all stakeholders to have the same goal. At the end Mr. Bashyal from Hoste Hainse and Mr. Paudel from JCYCN focused on utilizing the support at an optimum level to achieve results for education and also on how we can reduce the dropout rates in government schools as well as promote girls’ education and empower them. Both of them also focused their speech on how we have to depend on donors to solve our problems. Suggestions were also made to work together as a team.